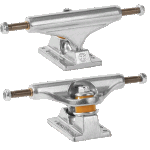 Trucks are a key component when assembling your board. 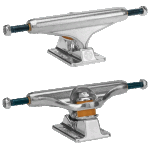 They are the metal T-shaped pieces that act as the middle man between your skateboard and your wheels and bearings.Every skateboard needs two trucks per setup, and each truck holds two wheels with two bearings each (not included). It is important to choose trucks that are the right size for your deck because they control your turn. Axel The Axel is the rod that extends through the hanger of your truck. A wheel (with a set of bearings inserted) is held in place on either side by an axle nut. This is typically made out of steel, or titanium for more durability and strength. 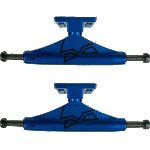 Occasionally after repetitive force from performing big tricks while skating, the axle can start to slip or the axle threading can wear down. This means that the axle will shift and slide to one side. Sometimes the thread on the axel can also get worn out and might need rethreading with a special tool (some T-tools come with an axel rethreader). 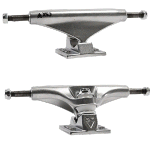 When this happens it is recommended to flip the axel nut, use a different nut, try a rethreader or sometimes it is best to just simple buy a new pair of trucks. Axel Nut An axel nut is placed on a truck's axel to keep a wheel in place. Speedrings Each truck comes with four speedrings. 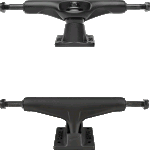 Two on each side of the truck axle. These are small washers placed on your truck, to prevent your bearing for seizing up when you crank the axle nut. Kingpin The Kingpin connects the Hanger to the Baseplate. Bushings The bushing are the donut shaped plastic polyurethane component that sits on your kingpin, one on each side of then. 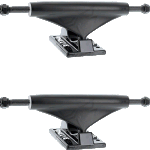 The are two bushing per truck, so four in total per skateboard setup and come in diffrent degrees of duro, ranging from soft, medium and hard.